Gavin Moynihan hopes it blows for the last 36 holes as he bids to regain his card at the gruelling European Tour Qualifying School Final Stage in Spain. A rough weather specialist, the Dubliner (24) shot a one-under 70 in his fourth round on the Lakes Course at Lumine in Tarragona yesterday and lies just one shot outside the crucial top 25 and ties with two rounds to go. Tied for 29th on 11-under despite battling a back injury, Moynihan said: "I'm in a good position and there's bad weather forecast for last two days, which is good." 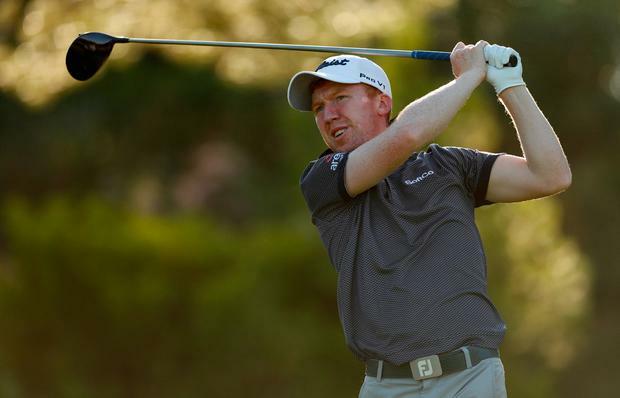 Ardglass' Cormac Sharvin and Tramore's Robin Dawson were among the 77 who made the six-under par cut, securing Challenge Tour cards for 2019. Tied for 132nd after 36 holes, Sharvin followed Monday's 66 with a four-under 68 on the Hills Course yesterday to sit just four shots outside the top 25 on eight-under with Dawson picking up two late birdies to make it on the mark after a gutsy, two-under 70. England's Daniel Gavins leads by a shot on 20-under from France's Clement Sordet after carding a two-under 69 in rising winds.